The health niche is a popular blogging topic that offers a lot of opportunities to online business owners as well as affiliate marketers. However, it is also a very broad topic to write about. As a blogger of this niche, where do you start? 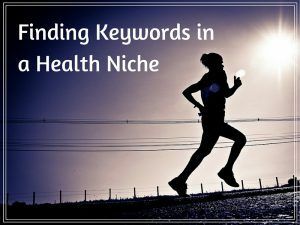 In this article, I will show you how to find related keywords that can help you write more targeted health blog. Before you make a decision, take a moment to think about the concept of health in each topic. For example, what exactly are people looking for in women’s health? Probably beauty and fitness, I would say. What about children’s health? Most likely the growth and development of a strong body and mind. Once you are able to grasp the concept, you will know what kind of information that people are likely to search for online and what type of product you can promote as part of their solution. Personally, I have always been interested in a healthy lifestyle and I want to find a driving factor that motivates people in this direction. We all know that a healthy body has a lot to do with our lifespan. So I was really curious – do people want to live longer? I began my research using Google Trend and this was what I found. But what kind of topic can you talk about in relation to longevity? Google Trend actually has some answers for me. If you look closely at the graph, you can actually find a few news headlines in the last couple of years, discussing about this topic. Exercising to develop a strong muscular system and to control body weight. Developing strong bones to prevent osteoporosis. Developing a healthy mind and spirit through meditation. Quitting smoking earlier in life. Type of foods that help to extend your lifespan. These are really interesting topics to write about so now let’s move on to do some keyword research for each of them. If you are not familiar with niche blogging, it all starts with the right choice of words specifically, long tail keywords. They can help you to focus on writing blogs that people will want to read. From here on, I am going to use my favorite tool called Jaaxy, to perform some of the keyword research for you. (1) For example, are people interested to “exercise for stronger muscle”? Pay attention to the AVG (number of searches per month) and the QSR (the level of competition for that keyword) values. Ideally, you want to select keywords with high AVG and low QSR (and green KQI). Although there were insignificant searches for ‘stronger muscle’, there are quite a number of searches for exercising core muscle, muscle gain and weight loss which have fairly low QSRs. If you can recommend any relevant equipments or exercise programs, those are good topics to write about on your blog. (2) What about “preventing osteoporosis”? According to the results, you can write about how to prevent it from getting worse and the type of food that can help to reduce the significant of this condition. These are good ideas if you know of any food or tips in helping older people manage the disease. (3) Now, let’s check on “ways to prevent cancer”. 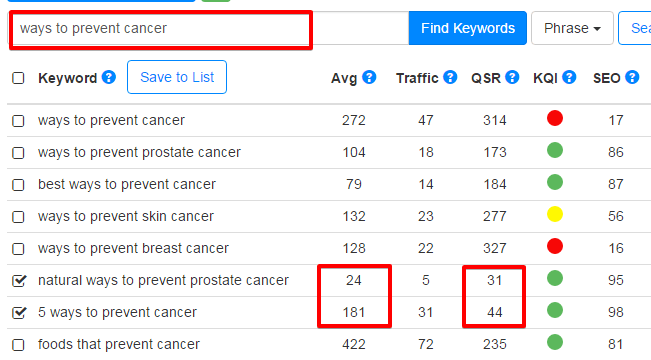 As you can see, there is a lot of competition with this variation of keywords, so your best bet would be to choose ‘natural ways to prevent prostate cancer’ or ‘5 ways to prevent cancer’. Alternatively, I think it’s better to refine the topic according to the types of cancer for better keyword results and also look into the potential of using natural remedy to avoid or manage the disease process. (4) Next, let’s see what Jaaxy says about “quitting smoking”. Now, these results are very interesting. The competitions are extremely low for ‘quit smoking in a month’ and ‘in 90 days’ so I think they make very good articles if you know of any programs or books that can help people to achieve these results. (5) Lastly, let’s look at what food to eat because obviously, it has got a very strong correlation to living a healthy lifestyle. Aren’t these results awesome? Just look at the variety of low competition keywords that you can write about – food to help with lowering blood pressure, depression, cholesterol, and lose weight. These ideas can make great articles to go along with food recipes. In case this is confusing, what I basically done here is that I have broken down a broad niche (health) into sub-niches (healthy lifestyle) and found a growing trend (how to live longer) as the concept for my health blog. With that in mind, I was able to discover articles that can help me generate ideas (6 of them) and most importantly uncover long tail keywords (about 15 of them) for writing my blog content. Repeat this technique with other sub-niches and you should have more than enough to write for a month. As long as you can find a growing trend as your point of focus, the rest is just the matter of refining your keywords until you find one with plenty of searches and minimal competition. If your keyword research tool is capable of brainstorming ideas, it’s worth looking down the list for other interesting topics. In this example, I did a quick check on “how to live longer” and look what I found. 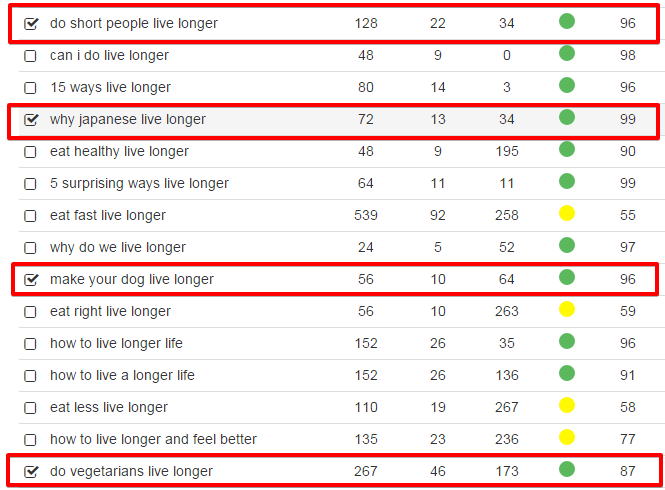 Publish some interesting articles with those long tail keywords and pretty soon, you will be getting traffic from short people, dog owners and vegetarians flooding your blog too. Bet you never thought about that, uh? 🙂 Now, it’s your turn to do some brainstorming using the Jaaxy Keyword Tool. Hey, if you need more help with keyword research for your niche (it can be ANYTHING), please visit my recommended blogging platform or leave me a comment below and I’ll get back to you, okay. What techniques and tools do you use for your niche keyword research? Do you have a lot of success with it? Please share your experience with us. Must say that is Awesome, AWESOME! brilliant article on how to use keyword research tool (I guess this would work with other tool’s also and not just Jaaxy). Brainstorming and how to find those keywords and write articles. I am in the health niche and must say that this article was a great read. Glad I stumbled upon it. Glad you’ve enjoyed this article. Yes, the same concept can be applied to any keyword tool of course. The only advantage of using Jaaxy (at least from my perspective) is that it’s FAST and EASY to interpret, as you have clearly seen in the article. Prior to this, I have no experience with keyword research but Jaaxy makes it possible for me to learn. As I became more efficient at finding and brainstorming long tail keywords, my research time is shortened (that’s a big factor!) and I can focus more on publishing and optimizing my articles instead. It’s really a great tool to use if you want to be more productive in your blogging routine. This is a great topic and finding keywords for any niche can become a tedious task. I remember one of the first domains I purchased was for a health site, and I had no clue what I was doing. My keyword was rarely searched and I had no idea how to create content for it. Keywords are really important, and knowing how to find them is just as crucial. Once they reach your CTA, you have a higher chances of converting them into your customers. And you really want to work along that flow (as if reading your reader’s mind), post after post, to train yourself in selecting effective keywords. It’s challenging initially, but with the training at Wealthy Affiliate, you’ll get there. I enjoy reading your articles why, because they are always so fun and informative to read. You are taking SEO and JAAXY putting them together, and making them understandable for anyone who reads this article. This information is great for any niche website that you decide to create and use these techniques. I have been using these techniques since I have been a member of Wealthy Affiliate and starting gets some of my content and products reviews at the top of page one in google. This is not an easy task always as you always will have others trying to compete with your spot and bumping you, but this system works. Thanks for pointing that out. I couldn’t stress how important it is to get your keywords correct from the very beginning. And what I mean is that looking for low competition long tail phrases and use exactly that for on-page SEO purposes. I speak this from personal experience because my first few blog post was written based on poor selection of keywords. As a result, my site ranking and traffic suffered for a long time. Of course, it’s always possible to go back and boost the old posts, but it’s just not time effective when you have other blogging tasks to do. Nevertheless, it’s a good experience to learn from and to discover that there are so many potential (and profitable) keywords within Jaaxy for any type of niche. I greatly appreciate your tips, as I enjoy healthy life style myself & being an advanced athlete at the same time, I have plenty of raw material to begin with but it needs a lot of polishing as my niche web is just a baby for now. 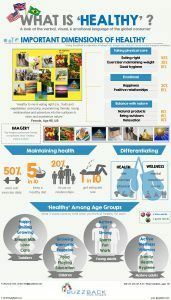 Especially, I enjoy the “What Is Health” image you got here – in my eyes it covers just about majority there is to health. Like a surge of energy, in a positive way. So many ideas here! Wonderful effort, I’ll be back for more. That’s a very interesting niche you have there ‘improving grip strength’. The first thing that comes to my mind is how important this exercise is for older people. My mom is in her 60’s and she doesn’t hold things very well and that is very dangerous as she could easily slip and fall. I know many elderly are facing the same problem so I think it’s a good idea to create a topic category helping this group of people. I am glad that this article has given you some idea to kick start your blog. Take advantage of the Jaaxy free trial to do some good research on your keywords. If you need any help, just get in touch with me within Wealthy Affiliate. It’s great that you pointed it out, I also feel that’s an important topic that can involve a big group of people. It also leaves us with good feeling because we know that we can truly help people in that way to better their life quality. It’s always nice to take care of our elders. As we focus on health in general, one thing is to aim for overall improvement, the other is to prevent injuries altogether. For example people that have suffered from stroke. Their hands might be very weak & even partially paralyzed. Also folks that fight on daily basis against tennis-elbow & carpal tunnel syndrome. This is where grip training comes in & can fix those problems completely by removing muscle imbalances, which in a lot of cases is the root cause. Rehab, prehab, balancing.. you name it. I like your ideas to put focus on elder people safety. It will definitely expand to my project in positive way. For your mom, if I were you, I’d bring her polymer eggs, hand-bands & for example, high-quality hand-gripper from IronMind specifically designed for youth, elders & anyone mending an injury. 10 mins exercising per day & she will be safe! Thanks for your help, I’ll be in touch! Great article and very clear explanation for Jaaxy. I really like this keyword tool. What do you think is better to use; keywords with low traffic and higher SEO score or high traffic with average SEO score & average competition too? I am thinking to try to add long keywords to my posts to improve my rankings. Definitely go for longer keywords because it will pull related keywords (aka semantic keywords) to boost your page ranking. Excellent case study into what you need to do to dig down into keyword research – a difficult topic for a lot of newcomers to blogging. From the images I see in your article, you are a Jaaxy user right? I was wondering how you found it and how well it had worked out for you so far. Yes, I am a Jaaxy user, but I only started using it 6 months after I build my website. I was using a free keyword tool and it was okay until I got curious about my page ranking. By then, I had published close to 50 posts. So I decided to check out the SiteRank feature by using the free 30 searches trial that came with my Wealthy Affiliate membership. I discovered that some posts rank well and others don’t. This gives me a cue to work on improving the post content and learned about my SEO mistakes. Seeing how this information can help improve my blogging moving forward, I went ahead with the Pro version. I really like how fast the tool works, the way it brainstorms long tail keywords and how the SEO power help me to decide which keywords to use. And of course, it pays to know that most of your posts are ranking well too.